There is nothing quite so frustrating as a baby who cries inconsolably and nothing you do seems to help. The following discussion is meant to help, although sometimes there is no "cure" for the problem. A baby's cry is her way of controlling her environment, and represents a call for help. Studies have shown that responding early to a crying infant eventually reduces total crying time. 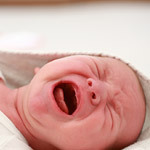 To help you understand your crying baby, we will discuss several categories of fussiness. Studies have shown that normal newborns cry an average of 2 1/2 hours a day. Much of this crying is associated with hunger. Since babies announce their hunger by crying every 2 to 4 hours, that's a lot of crying. This crying is necessary, first to get your attention, and second to become sufficiently awake so that they will take a full feeding and not fall asleep halfway through the feeding. By the second or third week babies begin to have periods when they are awake and fussy. This is often mistaken for hunger, but you'll soon recognize that food doesn't satisfy them. Think of these periods as exercise periods. The use of pacifiers or thumbs permits non-nutritive sucking, which infants need and enjoy. These periods may become predictable. They commonly start in the late afternoon or early evening and last two or three hours, but there is considerable variation. There are ways to help, and we will discuss soothing techniques shortly. These are usually normal babies who can create unusual levels of anxiety or frustration for a family with long periods of crying. They are not constantly fussy, whereas the "colicky baby" is inconsolably fussy for much of the day. There is often no identifiable cause for this behavior. They seem to be extraordinarily sensitive to their entire environment and overreact to hunger, wetness, heat, cold, too much noise and even too much handling. Special techniques are required, but first you must be assured that this is not a cry of pain or illness. Discussion with your doctor or nurse will be necessary. The truly colicky baby creates an especially stressful, but temporary, situation. These babies are unhappy "around-the-clock" day after day. Your physician will advise you about helpful techniques to deal with this problem. Parents are often concerned that extended fussiness indicates illness, and at times this is true. With an illness, however, the fussiness is often accompanied by other symptoms and behaviors, such as fever, vomiting or poor feeding. At these times your baby will need to be examined by her doctor to find the cause of the illness. Most parents will recognize these episodes because something is different. The baby who is milk intolerant begins to have signs of intestinal disturbance, which may be signaled by diarrhea, vomiting, cramping, excessive gas and/or crying. Parents may also notice rashes and wheezy breathing. This type of intolerance is more common with cow's milk formula but can be seen with breast-fed infants as food mothers eat pass into breast milk. Help from your doctor will be valuable in dealing with this problem. Try swaddling. Wrap the baby snugly in a soft, stretchy receiving blanket. Then rock, sing, talk softly or listen to quiet music. Stroking and patting are soothing. Use various positions like lying the baby face down across your lap. Offer a pacifier (no strings or cords attached around the neck). Your baby may seek her own thumb. Try a change of arms - dad, grandma, a helpful friend or neighbor - anyone who can sympathetically understand. Take a break from the baby. Have a bath, get outside or go shopping. Take some time for yourself. If the crying is continuous and last for more than 45 minutes to 1 hour call your doctor to have your infant checked to be sure that there is not a significant medical issue that is causing the extended crying. Being attentive to a crying baby will not spoil her during the first six months. Responding to her cry is comforting and may easily correct the cause, which is often hunger. When you are sure the problem is not hunger, do not offer food. You do not want to teach that food appears with all kinds of upsets. Most fussy babies outgrow this period and are not harmed or changed by it. As a parent, you too will survive this period. You need to feel free to call for help, especially if you feel so stressed that you fear you might hurt the baby. Most fussy babies begin to get better at about three months and life begins to return to a happier state. Finally, remember that most fussing behavior is normal.